Recently I published a recipe for Salmon Gravlax and promised I would follow this up with a recipe for Eggs Royale, so here it it. Normally for this dish one would use smoked salmon but I couldn’t resist using the salmon gravlax instead to give this classic dish a different taste. I’ve also been really craving Hollandaise sauce for a really long time but with my pregnancy I couldn’t touch it. Now I finally have a healthy, happy and cute baby it’s time for me to have some of those forbidden foods for pregnant ladies, such as Hollandaise sauce, home made caesar salad dressing, rare steaks, swordfish, tuna, this kind of ocean fish etc etc. So here is my version of Hollandaise sauce and Eggs Royale. For this blog post I also drew a step-by-step tutorial image for the hollandaise sauce. I’ve been thinking about illustrating some of my recipes for a long time and while the drawing does take up quite a lot of time, I’ve finally started it. It was fun to draw and I’m personally happy with the way everything has turned out. My illustrations could do with some refinement but this is something I will do more of in the future. Also some updates about Amelia. Amelia is now 11 weeks and 5 days old. Just like everyone says, babies grow up so quick and when I look at her now and photos of her when she was just born, she looks completely different. Amelia is now also communicating with us a lot more. She will talk back (in baby talk of course) if we talk to her, she smiles all the time and she’s now laughing a lot. Whenever she talks to us we will talk back to her in the same language she uses and she absolutely loves it. Chris is also the master of belly raspberries which she absolutely loves. There’s nothing happier in life than seeing your own baby happy. So below the photo of the Eggs Royale and procedure image below, there are some new photos of Amelia. Being a parent is an extremely tiring job but as you can see she now has a really cute smile so every time I/we feel tired, frustrated, one little smile and everything is perfectly happy again. We’ve also had some really amazing weather here in Scotland recently (at least by Scottish standards) so we’ve been travelling around a little bit. In my next blog post I’ll share some of these photos. Place one tablespoon of Hollandaise sauce on top of the poached egg. This dish is now ready to serve. Recently for both this blog and at home, I’ve been making a lot of Eastern dishes but now I really fancy eating something a little different. Also, there are so many really delicious and beautiful western dishes that I love to make, both professionally at work and at home, but haven’t had the opportunity to share. So, for this particular blog post, I decided to make salmon gravlax. 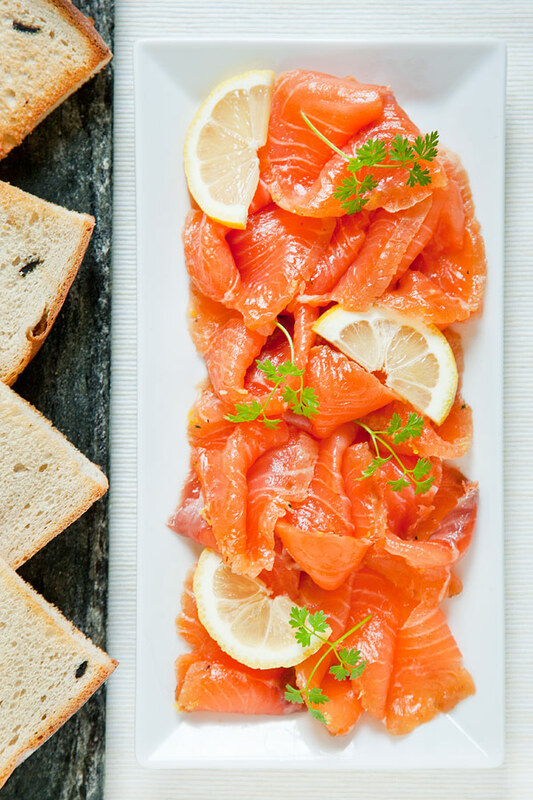 Salmon gravlax is a dish which originates from Norway during the Middle Ages. Fishermen used to salt the salmon then lightly ferment it by burying it in the sand. Gravlax’s literal translation is “grave”. Thanks to Wikipedia for this information and also inspiring me to draw a couple Vikings for this recipe. Now this is probably going to sound really strange but even though I have made salmon gravlax many times professionally, I’ve never actually eaten it. I know this sounds really bizarre but probably because I’ve prepared it so many times I’ve kind of been put off it but my husband absolutely loves salmon gravlax so when I asked him if he fancies eating it, of course he said YES (with capital letters)! I first learned how to make salon gravlax when I worked in a fine dining restaurant in Birmingham but after moving to Edinburgh I made it a few times while working in a hotel that I used to work in. Again I know it must sound strange that I haven’t tasted it before but as anyone who works as a chef knows, you barely even have time to have a glass of water or go to the toilet (this is one of the many reasons chef smoke – so they can have a cigarette break). With this dish I combined two different recipes. So what do I think? Interesting! It has a really unique mild herb and spice flavour with a little bit of a citrus taste. I have to say I like it very much and Chris gave me the big thumbs up. I liked it so much I used some of this salmon gravlax to make eggs royale (I’ve been absolutely crazy lusting after hollandaise sauce for nearly a year but couldn’t eat it because of the raw eggs which is obviously bad for unborn babies). So I hope you enjoy my salmon gravlax recipe. It’s great to try a new dish and tick off one of the many hundreds of dishes out there that I want to try. As there a really large number of preparation photos with this post, I haven’t included any new pictures of my daughter or any updates about her (she’s doing fine btw, she’s absolutely awesome) but in a few days I’ll post my recipe for eggs royale along with an update about her and some new photos. Rinse salmon under cold running water and pat dry with kitchen napkins. Mix the sea salt, sugar, crashed peppercorn and ground coriander in a bowl evenly. Lay couple sheets of cling film on a tray as procedure photo shown. Put salmon on the middle of tray. Pour vodka and lemon juice on salmon. Sprinkle lemon zest on the salmon first then sprinkle step 2 seasalt and spice mixture evenly on the salmon. Sprinkle chopped dill on the salmon and wrap salmon nice and tight with the cling film. Try to find something heavy put on top of salmon. I used 2 wooden boards on both side of salmon and wrap really tight to give it a bit of pressure to help it totally marinade. As of this past Saturday I’m now 36 weeks pregnant. I really do think I’m one of the luckiest pregnant women in the world as you may have heard a lot of pregnant women have unusual cravings during pregnancy. Amongst the strange cravings I’ve heard pregnant women have include wood and coal. But so far my cravings have been really good. This pregnancy has to an extent put me off red meat but I absolutely love fresh fruit, vegetables and sour dressings. The only unusual craving I’ve had is ice cubes which I absolutely love! My husband has been laughing at me as I’m not normally a cold drink kind of person but with great fortune Edinburgh as of early February is one of the warmest places in the UK and we haven’t snow yet. One of my other cravings right now is sour food so I made this Thai Chicken Salad. I got inspiration for this salad from a holiday I had in Thailand a few years ago and I absolutely love Thai food. Also since going on maternity leave I’ve been cooking every day and cooking everything from Italian to Chinese to Scottish food, but not Thai. This recipe probably isn’t that authentic but it’s really delicious, fresh, sour and really healthy, absolutely perfect for my pregnancy. Put all the ingredients except the lime juice into a small sauce pan. Boil at first then simmer for 15~20 minutes. Stir often to prevent the ingredients burning at the bottom of the pan. Add lime juice and bring it to boil again. Use a sift to pass the dressing and leave the dressing to cool down. Marinade chicken thigh fillets for 30 minutes. Use a griddle to char grill the chicken and leave it aside to cool down a little bit. Cut the chicken into strips and mix with spring onion, lemon grass, galangal, mint and chilli. Place salad leaves and tomato on a plate and place the chicken on top. Sprinkle cashew nuts and dressing on top and it’s ready to serve. ** I will make dressing first then start the other preparation works.